Or Click the PLAY Button on the YouTube Video below. 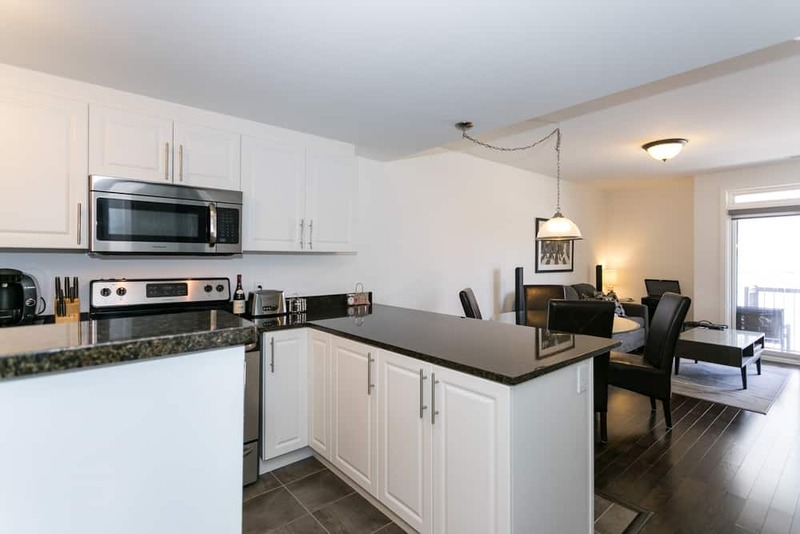 Step into this recently built large unit (739 sq ft per plan) and enjoy beautifully upgraded hardwood floors, granite counters, stainless steel appliances, in-suite laundry. Two full baths means the large master enjoys a full en-suite. The den is also a generous workspace at 11′ 3″ by 9′ 2″ and makes a great place to work or easily accommodate a murphy bed for the occasional guests. Underground Parking spot and locker is also included. In total control of your own heat and air conditioning means you’ll be comfortable year round. This quiet low-rise is tucked away just a bit out of the fray and within just a couple of blocks of campus and in fact within 3 or 4 blocks of almost anything you can imagine. You can literally walk-everywhere and soon there’ll be a light rail Transit station just around the corner. You’ll feel like you’re living on campus yet with your own quiet place to study. The open concept layout has a very efficient footprint designed to offer space for a dining and living room and good sized kitchen with lots of counter space. Step outside on to your private balcony either from the living room or bedroom or venture up to the roof terrace to enjoy the view, the sun or a few steaks on the BBQ! There’s also a garden you can sit out in at the back and bicycle racks. With an incredible Walkscore of 97 – it’s truly a spot to partake of the best that Ottawa’s Urban Lifestyle has to offer – just steps to the Famous Byward Market, night spots, restaurants, theatres, the Rideau Canal, The Rideau Centre, Parliament Hill, river bike and walking paths – truly every thing you’ll need is walkable! Click on the attachments below to view the floorplan and property details!